I knew this design could translate into a wonderful, simple valentine. I used a Stampin' Up alphabet and a little heart die. Wow...amazing card and so sweet! Love that sweet red glittery heart, just fabulous for Valentine's Day. Clean and GLAM Love!!! SUBLIME! The added glitter LAYER is Fantastique!!!! Fabulous CAS card, Ardyth! Love how you've translated the photo into this beauty. Way to rock the inspiration from the pin Ardyth! If this is what I can accomplish every time I visit Pinterest, then by golly I'm planning to visit twice a day! Stunning simplicity with a touch of elegance in the glimmer & glam of the bling! Absolutely gorgeous!!! You're the queen of stunning CAS cards, and today's card proves that! I absolutely love this one!! I heart this too! 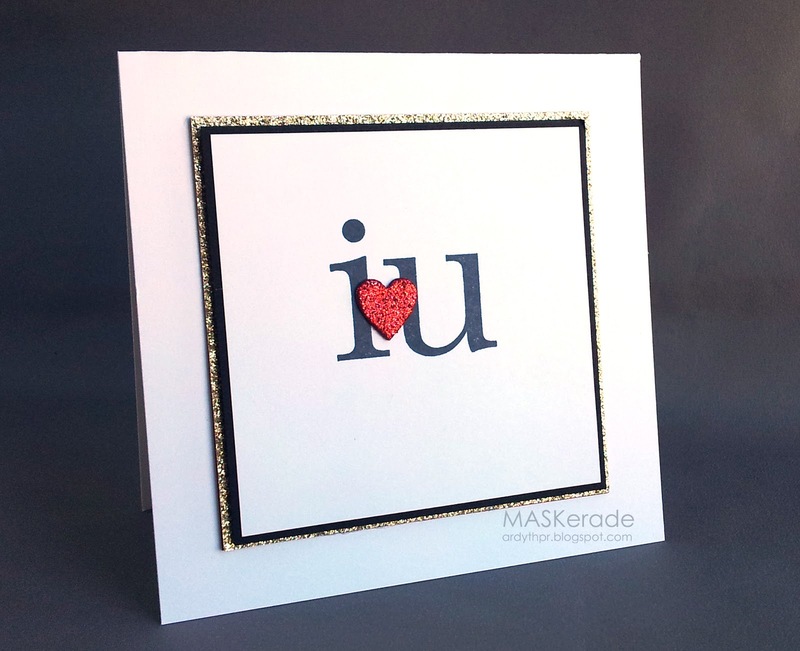 Love the little perfectly placed heart and the patterned "frame" peeking beneath! Another CAS beauty. Boy, I don't check my blog reader for a day or so, and I am amazed at all I missed. Love that you are so creative and prolific.